In the normal eye, light passes through a clear lens before it reaches the retina. The lens focuses light on the retina. In an eye with a cataract, the lens becomes cloudy. This clouding distorts rays of light and prevents light from being focused on the retina. This results in distortion of in one's vision. The lens of the eye is composed primarily of protein. 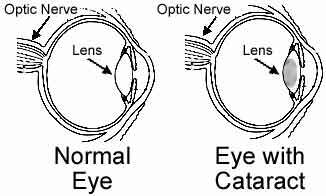 Cataracts are caused by changes in the chemical makeup of the lens. With age, the lens becomes thicker and less clear. Age: as people get older, the risk of cataracts increases. Approximately 50% of all people in the US over the age of 65 years have cataracts. Ultraviolet Radiation: excessive exposure to sunlight increases the risk of cataracts. Cigarette Smoking: smokers have a higher chance of getting cataracts than non-smokers. Eye Injuries: injuries to the eye increase the risk of developing cataracts. Eye Examination: a doctor will look at the lens of a patient's eye to check for cataracts. Surgery: a cataract is removed and a new lens is inserted into the eye. "Cataract" comes from the Latin word cataracta meaning "waterfall." Looking through a waterfall is similar to the vision that results from cataracts.